Even though texting while walking is less dangerous than using a mobile when driving, pedestrians are still a risk to themselves and others if they’re distracted by their smartphones. In New Jersey, a recent bill could see this activity banned, but in Germany, one city is taking a different approach to the problem. Instead of turning it into a punishable offense, officials in Augsburg are making the city’s streets a safer place for those pedestrians engrossed in their smartphones by installing traffic lights in the sidewalks to warn them of oncoming trams. While momentarily looking up from a mobile device may not seem like too difficult a task for most people, the number of walkers using their handsets at busy roads is increasing. As noted by The Washington Post, new research show that 20 percent of pedestrians in Europe are distracted by their smartphones when walking. The problem is even higher in the US, where 33 percent of people admit to it. The lights, which have been operating since last week, mean that smartphone addicts can now see the road warnings while using their devices. “It creates a whole new level of attention,” said city spokeswoman Stephanie Lermen. 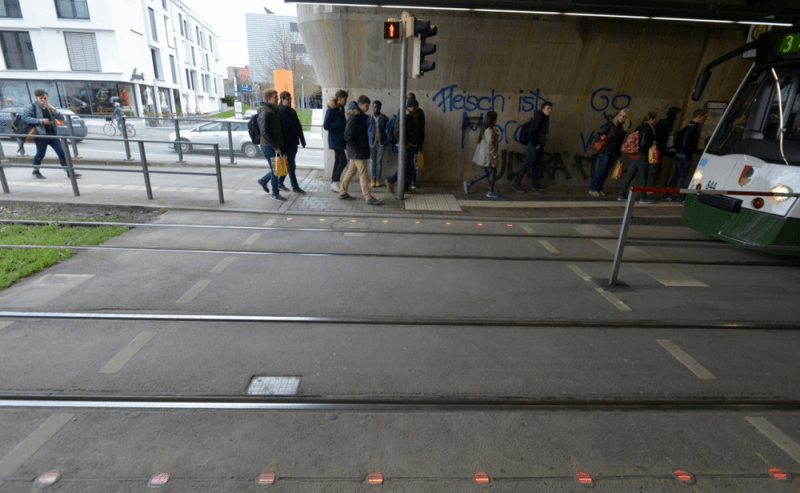 The idea to install the lights in the ground came after a series of incidents involving people being hit by trams while looking at their phones. Two pedestrians escaped with minor injuries, but one 15-year-old girl who was wearing headphones was killed by a tram while checking her device as she crossed the tracks. Not everyone thinks the lights are a very good idea. "Until now, I didn't even notice them," one pedestrian told a local paper.